I love maps. They let me know where I am, where I have been and where I might be headed in the future. But I never expected that my interest in fishing might lead to me becoming part of a map-making team. It was already past the time of the solstice when I left home for my summer “job” in the Madison Valley working on the historic Granger and Longhorn cattle ranches. Part of my assignment was to help map the reach and path of a spring creek that functions as an important tributary and spawning area for wild Montana trout. I first learned of the project when my dear friend, the environmental engineer John Muhlfeld, otherwise known as the elected mayor of Whitefish, Montana, invited me to work on the project with him and a couple of his colleagues: Ryan Richardson, a fluvial geomorphologist, and Selita Ammondt, a wetland ecologist. John’s company, River Design Group, Inc., which is based in his hometown just outside Glacier National Park, led the project. The purpose of our work was to determine the extent and growth of wetlands in the O’Dell Creek restoration project area. The project, which was started in 2005 and spearheaded by Jeff Laszlo, the owner of both the Granger Ranch and the location of O’Dell Creek, spans 2,500 acres and includes 11 different restoration project phases. 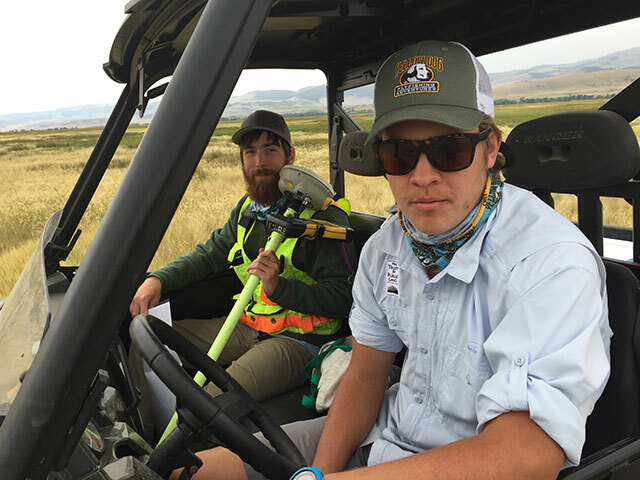 I had never been involved with mapping a landscape before and, being the youngest on the team, I was relegated by John to the role of grunt, chief Polaris Ranger driver, and data collector. We used two methods to remotely sense wetland acreage at the project site. First, we collected high-resolution aerial photographs using a low-flying drone, specifically a DJI Inspire 1 Drone. We then surveyed over 50 Global Positioning System (GPS) ground targets in the field to geo-reference the images. The timing of the aerial photo collection coincided with the dry season in the summer, so that wetland areas would be apparent against the backdrop of dry uplands or non-wetland areas. Our next task was the verification of remotely determined wetland areas through field wetland sampling. Our investigation of representative wetland and upland sites included characterizing vegetation, soil, and hydrology at each sampling site. My primary duty was to set down 55 black tarps/targets over the course of wetlands and riparian areas in an area measuring approximately four miles long by a mile wide, that the unique and entirely spring‐fed creek meanders through. I guess you can say that I got my fair share of walking in for the month. It took roughly four and a half days to complete everything. Each day I would set out roughly 18 targets and, after doing so, Ryan would use the drone to fly over the area that was covered in targets to get aerial pictures. Every five seconds the drone would take a picture, and eventually we would be able to stitch together a map from a bird’s eye view. After Ryan was done flying his drone each day, I would go back out and gather the targets that I had set out earlier. This process was repeated each day until we eventually covered all 2,500 acres. 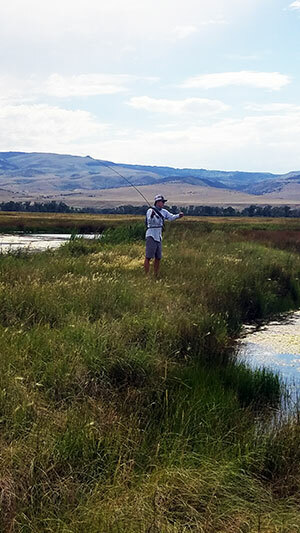 Results will be used to better understand how the O’Dell Creek restoration has improved wetland functions and values that are related to the Madison River, including nutrient and sediment filtration, and its influence on fish and wildlife habitat. Each workday lasted from 10 to 12 hours, unless you were me. Then they lasted an extra four hours if you include fishing as work and figuring you could sleep later. It was fantastic, because every day I worked it stormed, and afterwards there was a calm that came after the storm. The wind stopped, everything became active again, and the bugs were hatching, making the fishing that much better. One evening Ryan and I cast lines together in the old part of the restoration project where the ponds lay and where the creek used to run through. We caught browns and rainbows to our hearts’ content. They were all beautiful and of good size, which is great to see, because that means the restoration project is doing its job. Catching all of those fish was fun and all, however what came near the end of the day was breathtaking. “Watch this…,” I said to Ryan as I put on a mouse pattern the size of my thumb. “No f***ing way,” he replied. As I started casting he looked away. I slapped the fly on the far bank, and with the first strip of the line, a massive rainbow came rocketing out of the water. He missed. Then he circled back, his dorsal fin creating a wake from his size. He missed again, and again and again four more times! I looked up at Ryan with a huge grin on my face when his jaw dropped. I never managed to catch the fish but Maya Angelou once said, “Life is not measured by the number of breaths we take, but by the moments that take our breath away.” That moment truly was breathtaking. Being able to accompany professional mappers in their work was an experience that I will never forget and it gave me skills that I can apply to other things in my life – knowing how to map nature in a way that opens my eyes to so much more. Thanks to one of my closest friends, John Muhlfeld, I can now say that I really do know every inch of O’Dell Creek.